Join Shinn as he shares his story's and tips about gold making in World of Warcraft!! 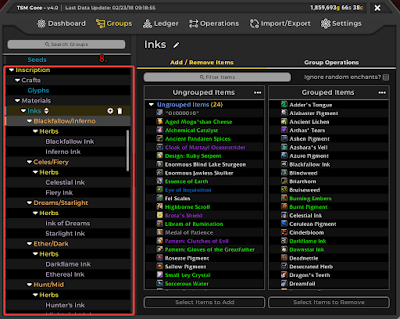 TSM 4 Beta: Inscription group for finding mats for glyphs. Why now and not wait till TradeSkillMaster 4 is released? I first noticed an issue when I wanted to restock my glyphs after running low and at this point I hadn't been using TradeSkillMaster 4 very long. 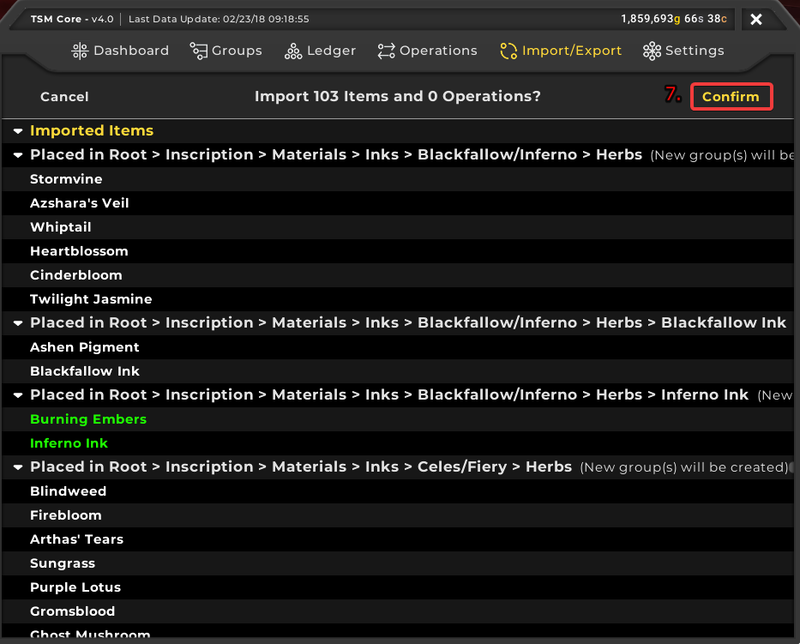 The problem is, you don't really know there's an issue until you use the Gathering on the Auction House to search for Inks/Pigments/Herbs like you would if using TradeSkillMaster 3. I loved this about TradeSkillMaster 3 and was gutted when it didn't work. 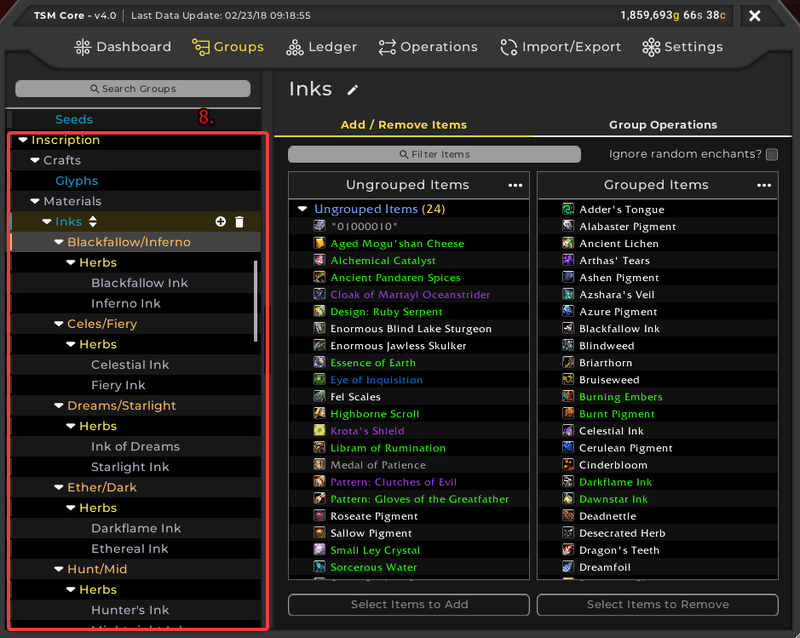 As of right now when you use Gathering it will only search for the Inks and nothing else...which is a pain, as is TradeSkillMaster 3 you could see straight away what the best/cheapest way of getting the Inks. I have spoken to Gumdrops from the TradeSkillMaster team and he has confirmed that they have not added the crafting search on the Auction House yet and he didn't give any timetable for this to be added...fingers crossed not too long! After a Friday night of getting frustrated trying to find a fast way of searching for the materials for the Inks I need, so I planned that I would spend my next stream going though the whole setting up a group to hopefully solve this issue until it gets added. It took me quite a while, but with help from The Gold Queen, Asakura and Olliebogs we did it. The only thing was I couldn't share this, as the export function wasn't working...but now it is, so here goes!! 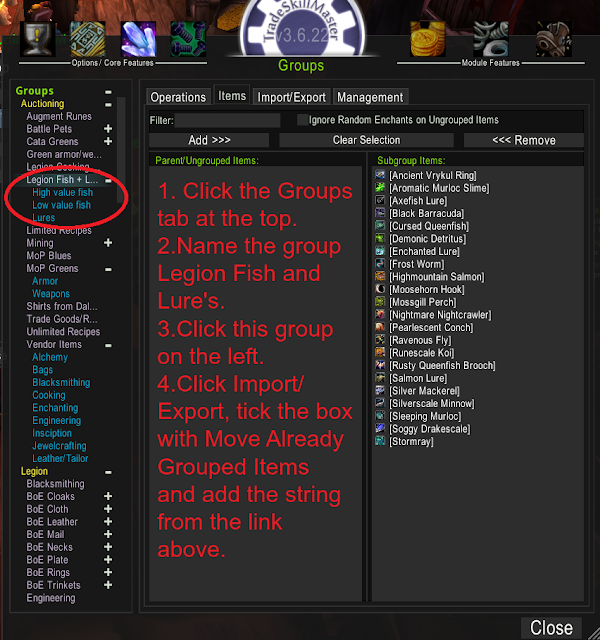 Next open TradeSkillMaster and follow the steps below, doing this with add a new group to your Inscription group which will have all the Inks with what herbs/pigments are used to craft them. I have also highlighted some pictures at the end of the blog which will also help in setting up this group. The numbered steps below match the pictures. Check your Inscription group to make sure you have a sub-group called Materials, if you don't please make one. Copy string into the box. 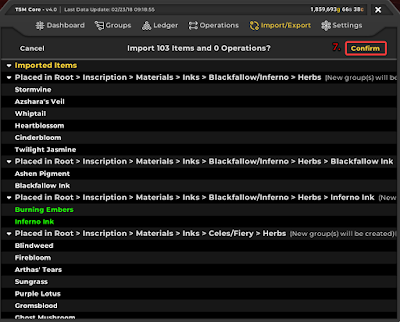 Open the Group Tab and you should a new sub-group added called Inks in materials. Hope you find this group useful!!! Tales of Gold Ep10: Its all about the stacks! Please check out the episode where I talk about how I'm making my gold right now and at the end I talk about how important stacks are when it comes to selling materials and other items. The Basic Steps on the Path to Gold Making. I wanted to let everyone know about a new project I have started on Twitch and YouTube which goes right back to the basics of gold making, which to be honest, is where my strengths are. So how am I going to do this? Well I'm going to be starting a new toon called Shinnshadow, who has no gold or heirlooms. I wanted it to feel like even if you were new to the game you could watch the videos/streams and pick up some ideas a long the way. Game play wise, it's going to be normal as possible, leveling up via quests,dungeons and killing lots and lots of mobs!! I have picked up the two gathering professions Mining and Herbalism, which are a good way to start making gold on a new server. I also have Fishing as there are some fish out there used in other professions and it costs nothing and could be a way of making some extra gold. Cooking is a really good professions in Legion, however I'm not sure how useful its going to be as we level though old content, but you never know... so how am I going to make gold? At the start its going to be mostly from farming ore and herbs as they can be found while out questing. Plus I will be selling items I have looted from mobs as in meat, armor, weapons and other random stuff I find along the way. Once the gold starts coming in I can then start looking into buying items of the Auction and then flipping for a higher price and below are the two addons that I will be using to help me. TradeSkillMaster ( TSM)- I use TSM for most of my Auction House posting and crafting, but it can take time to understand/use, but hopefully after watching my videos or streams you will be able to get the basics. I would also recommend visiting the /r/woweconmy & TSM Discord if you have any questions. Auctionator - I like to use this when posting stacks of items not set up in TradeSkillMaster. In TSM you can set up profiles which is really useful here, so not only am I starting with a new toon with no gold, I'm also started with a fresh TSM profile. I think this will be really good as I can build up the profile as we start added groups and operations, but also keeping them very basic. Currently I am planning on Streaming approximately once a week for a couple hours. Right now I don't have a set day or time, but it might be something I look into as we go forward. If you like the videos and fancy joining the live streams please go to mt Twitch page and click the follow button and follow me on Twitter to get updates. This podcast I mostly talk about mounts that can be crafted and sold on the auction house. Tales of Gold Episode 8: I'm back!! On this podcast I talk about where I have been and also talk about some of the professions/markets that I have been working hard on in Legion to make gold. Legion: Making gold from Fishing in Broken Shores. Can you make gold from fishing in Broken Isles? The answer is yes and its so easy to do. Even if you haven't done any fishing in the past, don't worry as you don't need a high skill level to start, you can fish even at one skill point. If you need to learn Fishing you can speak to Marcia Chase who can be found in Dalaran or from the other Fishing Trainers found in the major cities. Once you find this item it makes your life easier as it now shows the pools as a yellow circle. I would also recommend getting three addons called GatherMate2 , Fishing Buddy and Cross Realm Assist these can be found at Curse. GatherMate 2 is an addon which will remember where you have fished pools of fish/nodes and show them on your main map as a little picture of a worm on a hook. It also show them on your mini map, but this time as a yellow ring, which is really useful as you can plan a route out to make sure you get the most fish possible. Please note this also works for Mining, Herbalism, Treasure, Timber and Archaeology. I have used this addon for years now and It has helped me so much in all of my gathering professions!! This addon has a lot of options, but being honest, only use a couple. The main reason I use it is for Easy Cast where you can you cast by double clicking your right mouse button, which is good, and it can be set up to cast while mounted. I also like the option where it will force sound and make your bobber noise really loud so you don't miss that fish biting. It also makes a note in what area you have been catching fish and gives you a percentage of how much fish you catch in one area. You can see this in the screen shot below, which shows that I spend most of my time fishing at Whitewater Wash when in Highmountain. This addon is really handy when farming as once you have fished up all the pools in an area you can use this area to hop realms to find one with pools there already to fish. This will save you lots of time farming. In my very basic looking table below it tells you what common fish can be found in the Broken Isles and what zone they can be fished from. Each zone has a type of fish that can only be found in that zone, but Silver Mackerel is found in all zones and on Wowhead, they say if you just fish in open water and not the pools of fish you will get 80% of this type of fish and only 20% of the other fish found in each zone. The Black Barracuda can be found in The Great Sea which means it can be found around the coastline of the Broken Isles. While out fishing there is also other fish and lures can can be found which are useful and can help increase you fishing skill or help you catch rare fish. All of the rare fish listed below can be found by using the lures that are found from fishing pools of fish in the Broken Isles. Each rare fish you find can be thrown back in to give you +5 skill points in Fishing. The only thing is that these lures can be sold on the Auction House anywhere from 100g to over 3000g for an Ancient Vrykul Ring ( please note that these prices are from my realm)!! Please note that you can only have one of each type of lure in your bag at any one time. If planning on selling the lures you will need to post them to an alt before it will let you catch any more! Right, making gold from fishing is really easy if you only want to sell the fish on the Auction House, people out there will spend a lot of gold on fish as not everyone likes or wants to spend time fishing. The first thing you need to do is look at what the prices are for the common fish on the Auction House. 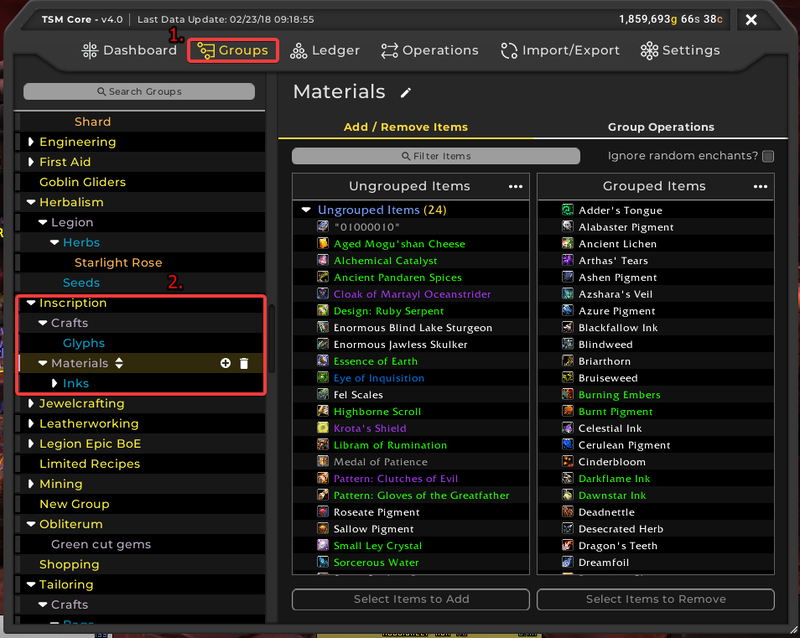 The way I do it, is make a group in TradeSkillMaster addon. You don't have to use this addon, but I think it helps save time and can help you make a lot of gold! To make a group is easy (Xionik has made a really good video showing you how this is done. 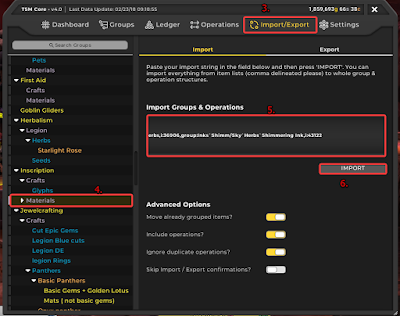 Here is video- TSM 3- How to set up groups), open up TSM using the mini map button or type /tsm in chat. Click the Group tab at the top and from here you can make a new group. I called my group Legion Fish + Lure's and in this main group I have made three subgroups, you can use this link Legion Fish + Lure's which will sort that out for you and also import all the fish and lures. All you need to do is import the item string and tick the Move Already Grouped Items and you should end up with the main group looking like this. You should now have a group made up the Legion Fish + Lure's, you will need to make four Operations, one for Shopping and three for Auctioning. Open TSM and follow the instructions below to make the operation. Now you should have a Operation like in the screen shot below, the only thing you wont have is anything in the Maximum Auction Price (per item). You can add whatever pricing source you want, you can check out here for of list of sources or type /tsm sources in chat. I have ticked the 'Show Auctions Above Max Price' as we are only using the shopping operation as a way of finding out the prices of fish before we set out to do some fishing. I've made three operations for shopping, Legion lures, Legion fish high and Legion fish low. Below are some screen shots showing my settings for posting. Operations>Auctioning>New Operation (add group name) >Post. The Posting Price Settings will be different for everyone, the way I do mine is to look at the price of all the fish using the TSM tooltip which can show a number of prices from different sources, I use Historical Price as my guide. After checking each fish I found that three out of the seven sell roughly around the 6g mark, but can drop below the 3g mark, so I've placed these fish in my Low value fish group. The High value fish group is where you will make most of your gold, there are two fish that can sell at the 15g mark. The last two fish are the really good gold making fish (Highmountain Salmon, Black Barracuda) these sell well at 30g, sometimes when there isn't a lot of stock on the Auction House they will sell for 50g each!! What I'm hoping to do by my pricing is to make sure I don't under-price the high-end fish, but also making gold from the lower value ones. The operations that you made up need to be added to the subgroups. Open the Groups tab and you will to add the shopping operation that you have made to the Groups> Legion Fish + Lure's group> Operations> Shopping> tick Override Module Operations> add Legion Fish + Lure's from the drop down menu. Now to add the shopping operations to each subgroup. Groups> High value fish> Operations> Auctioning> tick Override Module Operations> add Legion fish high from drop down menu. 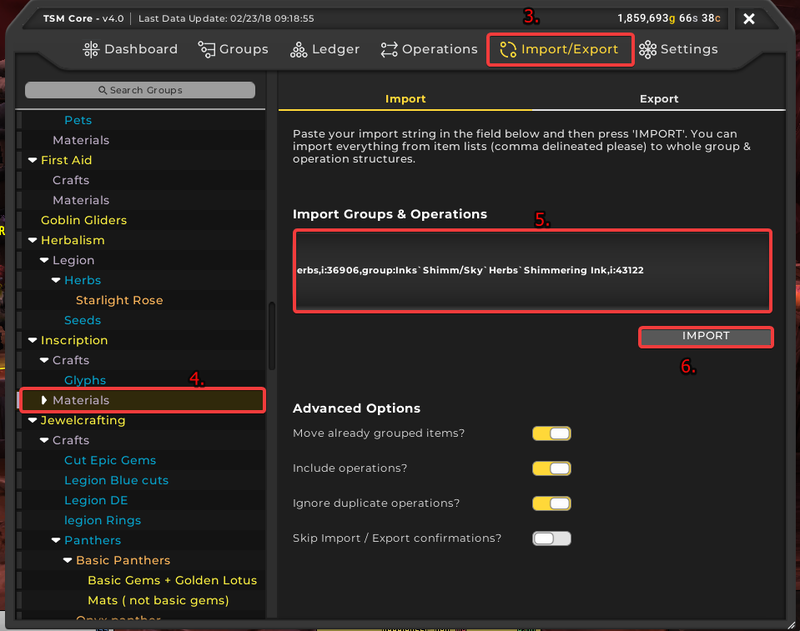 The other two subgroups are set up the same until it comes to adding the operations from the drop down menu. This part of the post I will show you the places I fish and the amount of fish you could catch per hour. I'm not a massive fan of farming, so I have only done a hour fishing of each type, hopefully it will still help with numbers you might get. All of the farming done for this was done on my Death Knight as I can use Path of Frost and fish on the open water. The area I fish is shown in red, its the area where you start questing in Highmountain (the area with the crops and where you have to kick the fish back into the water). You will need to use Cross Realm Assist here as its a small area of water with maybe four pools to be fished at one time. Using Cross Realm Assist made sure I always had fish. You will need to use Cross Realm Assist here as well, I tried to fish the large area of water around the Academy, but there is too many mobs that want to fight you. The area you want to fish is just north of the Academy its a river that runs up to a bridge. We need Cross Realm Assist here, but you should only use it after working your way from one end to the other. There is a waterfall at one end and lots of mob at the other which stop you looking further up. This is a large area of open water and the pools of fish do re-spawn quite fast. There are so mobs you might have to kill during your time here. There are three fish that can be caught in Suramar, Runescale Koi that is caught in the red highlighted area and Black Barracuda which is can be caught in the purple highlighted area. The Black Barracuda can be caught in the Ocean around the edge of the Broken Isles, The third fish is Silver Mackerel which can be caught anywhere in open water. When I fish for Silver Mackerel I fish in Suramar because I will also catch Black Barracuda which on my realm are the highest value fish. I fished for a total of three hours here as I had three types of fish to catch. Here are some sales I've had over the last couple of days while putting this post together, so far I have sold four out the seven types of fish and I'm happy as the ones that sold as they are the fish in my High value Fish group. I still have lots of Lure's and some low value fish left to sell and they will sell, but to be honest I'm going to stick to selling the fish from the list above. As you can see, you can make a fair amount of gold from a few hours fishing in the Broken Isles and look how easy it is!! Legion: Jewelcrafting and how I got on while leveling to 110. This post is about how a got on leveling my Jewel-crafting whilst getting to 110. The first design available to me was Versatile Skystone which you got by completing a quest, which talks about prospecting. I'm happy with Blizzard going back down this route as this means lots of ore will be moving though the Auction House. A quick point about Ore in Legion, there isn't that many modes, so it can take a while a gather a large amount and because of this the price of both kinds of Ore is high (Leystone, Felslate). I've done the first quest where you have to get 5x Gem Chip which wasn't bad at all and once you have handed that quest in you are sent on a quest that takes you around Dalaran and even to the Underbelly, just be careful down there as its a PvP area, but saying that you can hire a bodyguard for 5g from a NPC called Raethan as you head down there. I have been down there quite a few times now and its fine, just need to keep an eye on the time. By this time I just want to start making some Gems or Jewelry and by the end of doing the quests you get to start making two. Deadly Deep Amber (+150 Critical Strike) Please note there was another two choices of Gem, Masterful Queen's Opal (+150 Mastery) Quick Azsunite (+150 Haste) but you can only pick one. Now I needed some Ore, so off I went and started to quest in Stormheim and after prospecting some Leystone I found a new item Design: Mass Prospect Leystone which gives you Sangrite. Fast forward a bit as you don't need to go though every time I find or gain a upgrade though a quest. Below you will be a picture showing how many Rings/Necklaces and Gems i could make at level 106. To be honest, its not very many and I have done all the Jewel crafting profession quest available so far. This also shows that I now have two designs at Rank 2, which you can buy from Tiffany Cartier at Cartier & Co.Fine Jewelry in Dalaran. I have highlighted the map below in red showing where the shop is. You can also buy another fourteen Rank 2 Designs. Cost wise eight cost just over 33g each and the other eight cost just over the 128g mark. I wonder if there is another fourteen quests that I need to do to get the other Rank 1 Designs or they could be a random drop, I should check, but I like the thought on finding them along the way, but saying that...I may need one or two and its driving me crazy and I will make good use of the Wowhead guide! I'm now at level 110 and I have no more to add when it comes to learning any more designs or upgrades, but note I have spent 90% of my time completing two zone which were Stormheim and Highmountain, so there might be other designs to be found or bought in the other zones. Now that I'm 110 I will be able to add designs from faction vendors or dungeons. I will do another post in the future about Jewelcrafting and if its a good profession for gold making. Right the important part...below I will show you some screen shots showing what I've been selling and how much I've had to spend and the profit I have made. Ok my Jewelcrafter is also a Miner, but as you can see I have spent nearly 35k on Ore. You will see that I have spent 30k on Leystone and only 4k on Felslate, this is because the cost of Felslate is very high on my server right now...but in the future the price might drop. Its hard very early in Legion to give a max and minimum price when buying. Right now my max price for buying Leystone Ore is 20g each, which is high in some peoples eyes, but with not that many nodes around and no flying you can see why. Felslate is around the 60g mark and I only buy if under 50g. I'm very happy with the sales I've been having in the Uncut Gem market with a profit of 11k. The green gems (Azsunite, Chactic Spinel, Deep Amber, Queen's Opal, Sangrite, Skystone)that you get from Prospecting sell from 50g up to 150g each and they sell very well, but with Ore prices so high you need the blue gems (Dawnlight, Eye of Prophecy, Furystone, Maelstrom Sapphire, Pandemonite, Saber's Eye, Shadowruby) and I've taken a screen shot showing the value of uncut gems on the Auction House at the time of this post and I must say I sell 100% of any blue gems I put up for sale and I around the 90% mark for green gems. 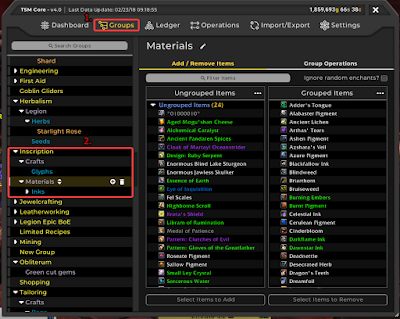 How to add my Vendor item list's to TSM. Vendor Items.......I still laugh every time I sell one!! New account (NA) and how to make I made the gold to pay for WoW Token. Podcast: Tales of Gold Episode 1 First of many! Bigger Fish To Fry Legion Achievement - The post Bigger Fish To Fry Legion Achievement appeared first on Journal of Marcus Ty - Legion Gold Guide. If you like what you see.....follow by email!! Copyright © 2016 · All Rights Reserved Shinn's Tales of Gold. Simple theme. Powered by Blogger.